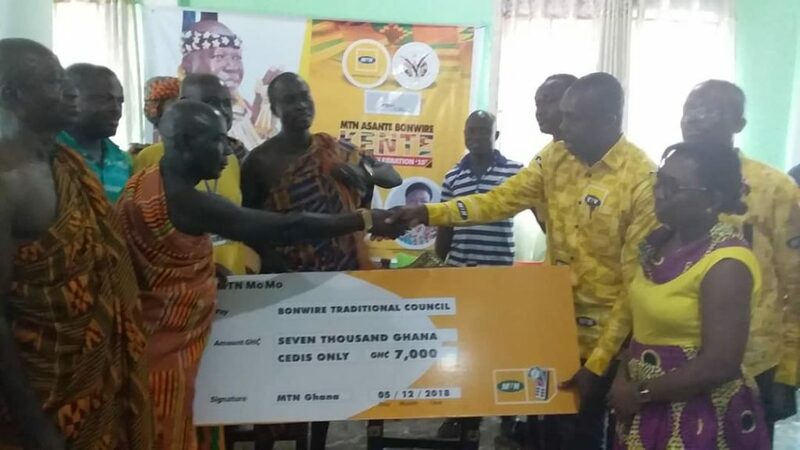 Kente Festival-MTN Ghana has donated GHC 7,000.00, a drinks hamper as well as air-time valued at GHC 500.00 to the chiefs and elders of Bonwire at a brief ceremony at the chief’s palace today. In addition, the company’s partners, Ashcell Limited is also sponsoring a beauty pageant for the ladies of the town with cash prizes for the eventual winner as well as the first and second runner-ups totaling GHC 2, 300.00. 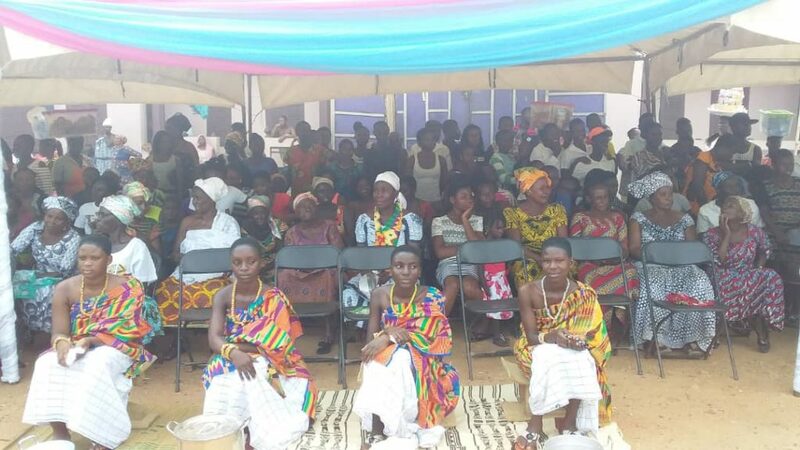 The donation by the telecom giant is in support of the ongoing Bonwire Kente Festival which climaxes on Sunday with a grand durbar by the chiefs and people of the ancient Ashanti town. Receiving a dummy cheque on behalf of the Chief of Bonwire, Nana Kofi Kwarteng, Bonwirehene Kyeame thanked MTN for the gesture. 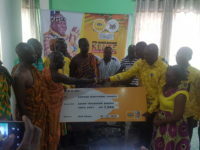 ‘’I, on behalf of the Chief and elders of this town want to thank MTN for this donation and we promise to use the funds and airtime to make this year’s ceremony a memorable one’’, Nana Kwarteng posited. Giving a brief history of the festival, Assemblyman for Bonwire electoral area, Krobea Asante said the Bonwire Kente festival is in its twentieth year this year. Starting in 1998, he disclosed the festival has become a notable one with people travelling from all continents of the world to come and witness the glorious Kente designs the community puts on display during the celebrations. He thanked MTN for finding it worthy to partner the chiefs and people of Bonwire to make the festival a glamorous one. Mr Asante charged other corporate organizations to take advantage of the festival and donate towards its celebration so that together they can explore the benefits of the Kente cloth. ‘’I am happy MTN has decided to be a part of this awesome festival which showcases all class and designs of the Kente cloth and I believe this relationship will inure to our benefit’’, the assemblyman noted. Mr Peter Bimpeh, Senior Commercial Manager of MTN Northern Business District handing over a dummy cheque of 7, 000gh to Nana Kofi Kwarteng, Bonwirehene Kyeame in a brief ceremony. 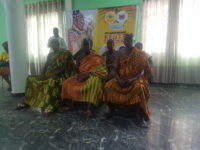 Addressing the chiefs and elders earlier on, Senior Commercial Manager for MTN-Northern Business District, Peter Bimpeh expressed delight that his outfit was supporting the Bonwire kente festival. 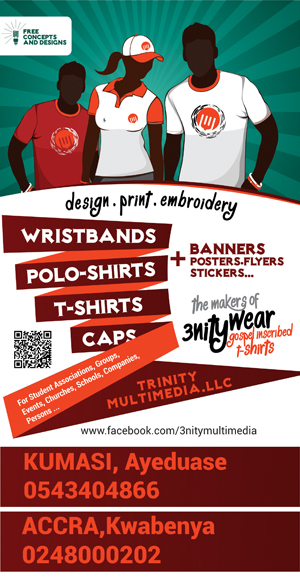 The company, he noted believes in the development of brands and items such as the kente cloth so as to make it possible to attract the necessary investments and patronage. With Kente being a unique cloth, Mr Bimpeh assured the chiefs and people of MTN’s commitment to furthering the partnership it has struck with them in ensuring the cloth generates the necessary interest as well as patronage during the ongoing festival. ‘’We in MTN are committed to partnering with the chiefs and people of this town to make the unique cloth of Kente attract the interests and investments it deserves in this year’s celebration’’, Mr Bimpeh noted.